The top is down on the white Porsche 911 Carrera S Ole Scheeren is driving as we move fast through the hills of Los Angeles. In a crisp white collar and Prada sunglasses over his model-like good looks, the German architect and head of the global architecture firm Büro Ole Scheeren doesn’t have much time. He’s here for about a day, on a short stopover between projects situated at opposite ends of the earth. The sprawling landscape of L.A., with its one-story bungalows and gated low-rise mansions, is unlike the type of architecture he’s been known for. The bulk of his firm’s high-profile work is on the scale of hyper-dense Asian cities, where massive buildings are called on to serve many roles and users. Scheeren’s work has embraced this flexibility, combining residences and offices with community spaces, public plazas, and natural habitats, all bundled into deliberately sensational structures that have, in a very literal sense, bent the rules of the 21st-century skyscraper. As a counterpoint to skyscrapers that compete on the cityscape with their vertiginous ambitions and strict hierarchies of value (with the best views, and thus, the better properties, up at the top), Scheeren’s buildings take a problem-solving approach to maximizing community and sustainability, often with unorthodox aesthetic results. In Asia, where densely populated hubs demand a diversity of functions within tight spaces, Scheeren has made his reputation on wringing more out of each project. Now, he’s hoping the rest of the fast-changing world is finally ready to adopt his unorthodox approach. 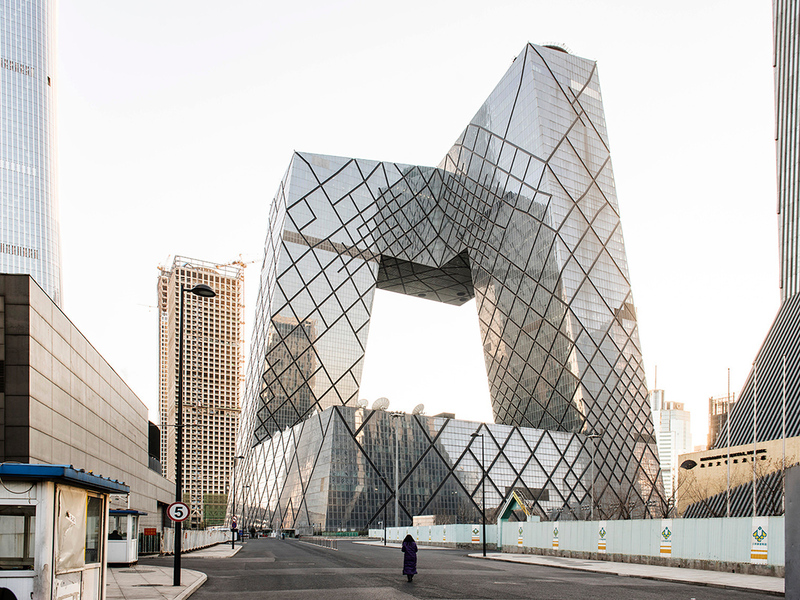 Scheeren first burst onto the scene in 2002, when Rem Koolhaas’s global architecture firm OMA won a competition to design a new headquarters for CCTV, the Central Chinese Television network. Fresh into his tenure as a partner at the unusually ripe age of 31, he managed the project from headquarters in Rotterdam for two years, before moving to Beijing and directing the firm’s practice in Asia. Externally complete in time for Beijing’s 2008 Summer Olympics, the building—a soaring loop of slick dark glass and steel—created a sensation. Two monolithic trunks rise hundreds of feet up, a bit off-kilter, then suddenly jut out into massive cantilevered arms that connect into a bear hug. “It’s like folding a skyscraper in the air,” Scheeren says of the seemingly improbable design, which required then-novel algorithmic analysis to ensure that it would stand. Skyscrapers, up to this point, had risen straight up; CCTV’s design goes up and out. 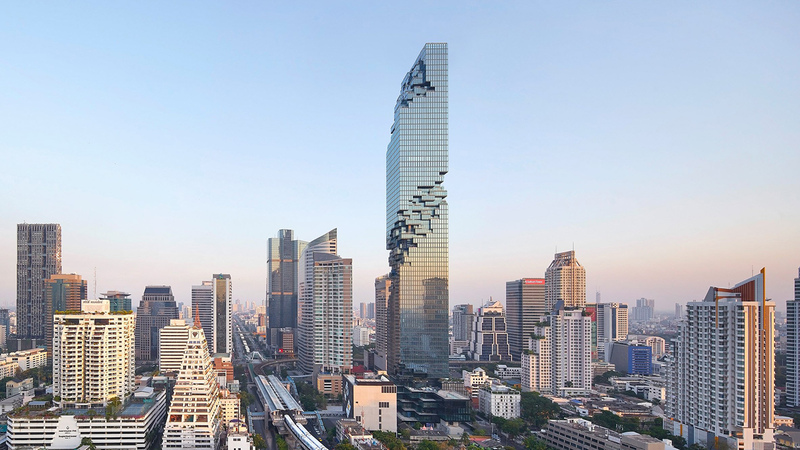 “Five years earlier you could not have even engineered the building because the parametric tools were not far enough developed,” says Scheeren, who is credited, with Koolhaas, as its codesigner. The experience of leading this complex and high-profile project led Scheeren to venture out on his own, launching his firm in 2010. He kept his base in Beijing to stay embedded in the booming Asian building market and quickly nabbed several significant commissions. The first three have recently been completed. 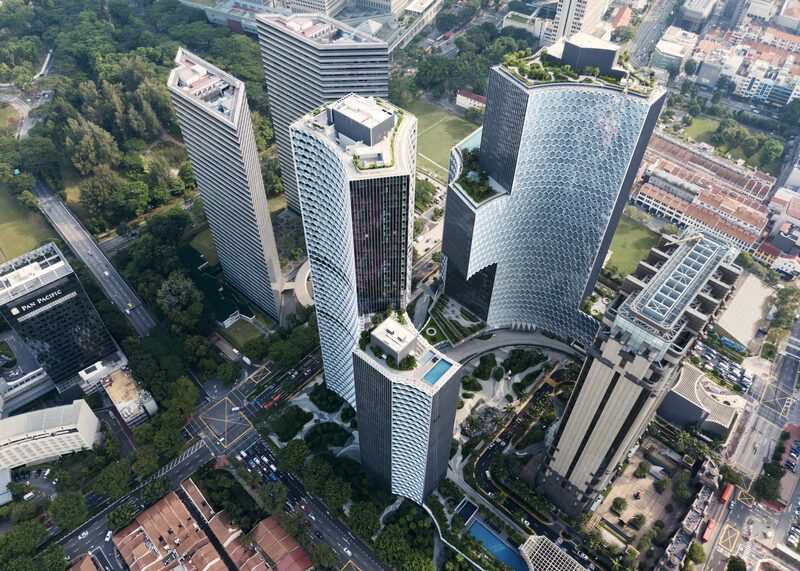 The largest is Duo, a two-tower project in Singapore shaped with the forces of nature in mind. 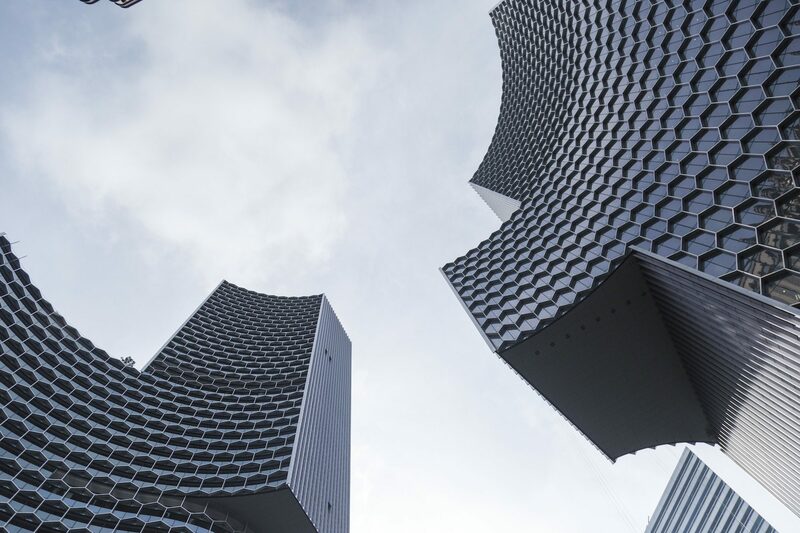 The concave towers—49 floors of residential and 39 floors of office and hotel space—curve around a circular plaza. As they rise, more unseen circles slice away their edges. 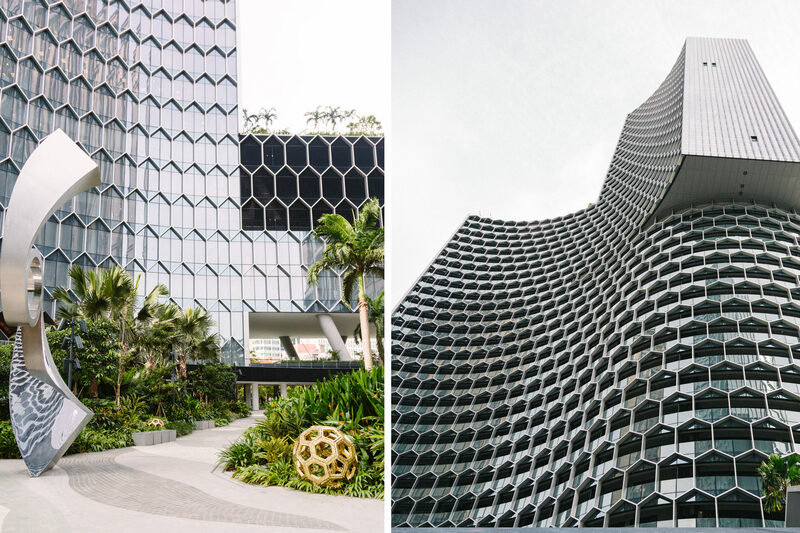 These sculpted facades are the result of mapping wind-shear and shade patterns, details that helped the firm stimulate cooling effects, create microclimates between properties, and ultimately do away with energy-intensive air conditioning in an often humid, stifling tropical environment. “We made the thing entirely self-sufficient through intelligent passive designs that only required nature to do its own thing, rather than be controlled,” he says. 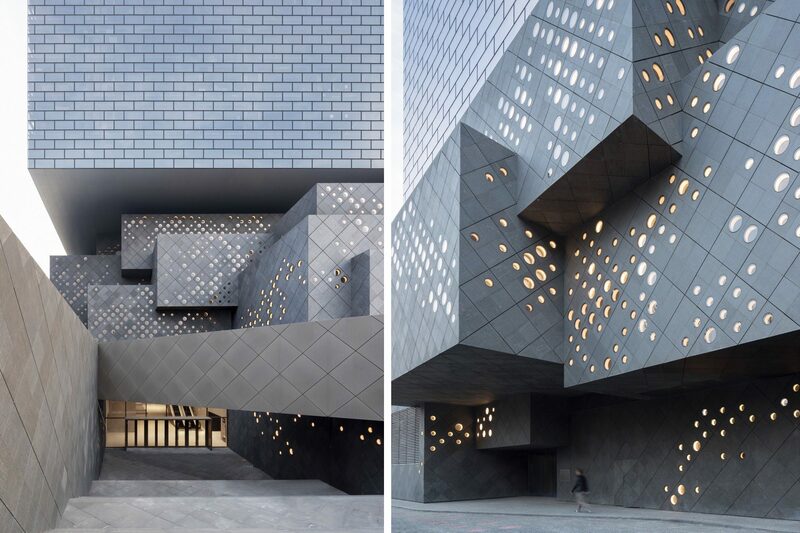 And in Beijing, one of Scheeren’s few non-tower projects is the Guardian Art Center, a 600,000-square-foot hall and exhibition space for China’s oldest art auction house. With just eight of its stories above ground, it’s a relatively modest series of small intersecting rectangular volumes stacked atop each other, crowned with a boxy mass that serves as a hotel. Located close to the Forbidden City, the mix of public and private spaces opens up the typically cloistered world of art sales. Scheeren grew up in the southwest of Germany, near Stuttgart and the French border, in a city called Karlsruhe. His father was an architect, and Scheeren was subsumed into his practice from a young age. By this point, he was set on a future in architecture and wanted to see as much of it as he could. So he left home and drove across Europe, visiting notable buildings from history books and contemporary magazines. This proved enlightening, and a bit of an adventure: Scouting houses by the Swiss architect Luigi Snozzi in the Italian part of Switzerland required some minor trespassing. “I was walking through a private garden to try to get a glimpse of a house when an old lady busted me,” he recalls. After some screaming, she eventually let him in. He spent the whole day with her, learning about the design of her house and how it had impacted her life. Scheeren, who went on to study for a time under Snozzi at the university in Lausanne, says this experience was life-changing. “I thought this was really something, as specific and tiny as it was, that was potentially meaningful in what the role of architecture could be,” he says. Creating that kind of “emotional detail” and human connection—with the built space, as well as others inhabiting it—became his personal objective. 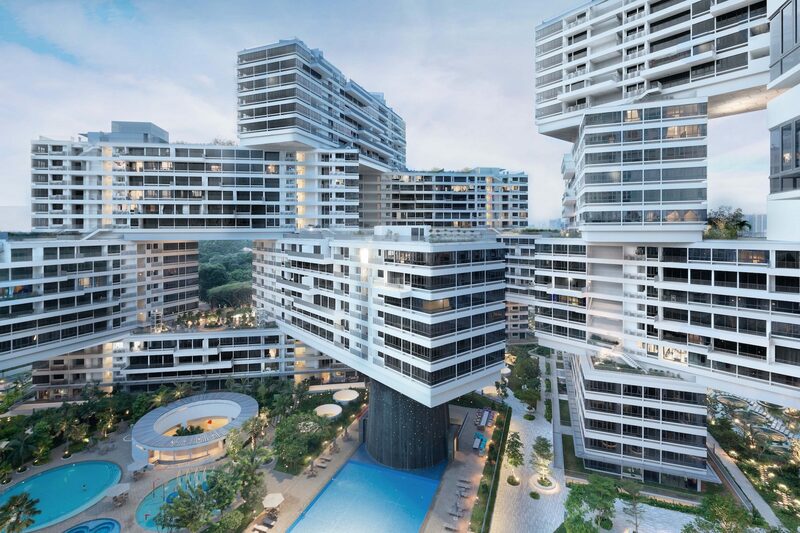 The Interlace, a 1,040-unit residential complex in Singapore and one of the last projects Scheeren designed while at OMA, is the most effective realization of this ambition so far. Completed in 2013, its honeycomb-like arrangement of horizontal buildings, all stacked and pivoting off each other, contain a few dozen apartments each. 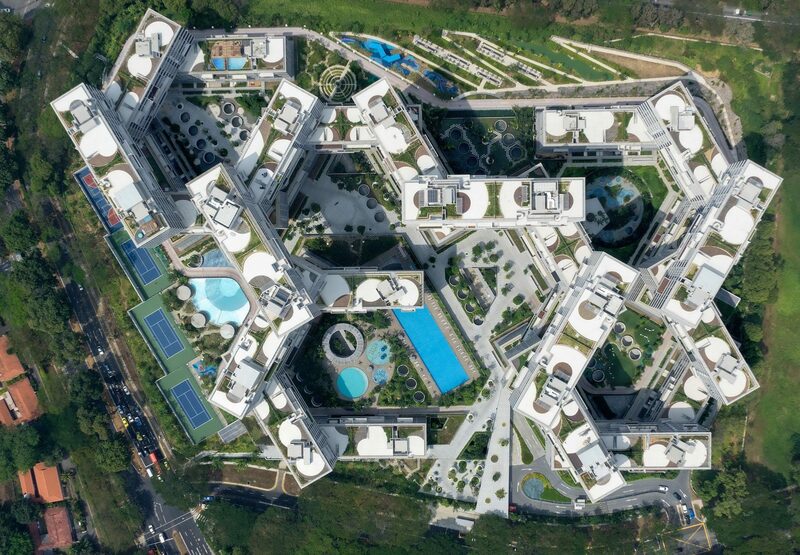 Atop the hexagonal tangle are rooftop gardens, and beneath it, generous plazas and pool decks—abundant common areas that encourage human flows and interactions. It’s a clever reinvention of Singapore’s towers-in-a-park stereotype in which the towers themselves become the park. In his book Building Community: New Apartment Architecture, writer Michael Webb lauds the project as a model for multi-family living. “Scheeren’s priorities are community and quality of life,” he writes. 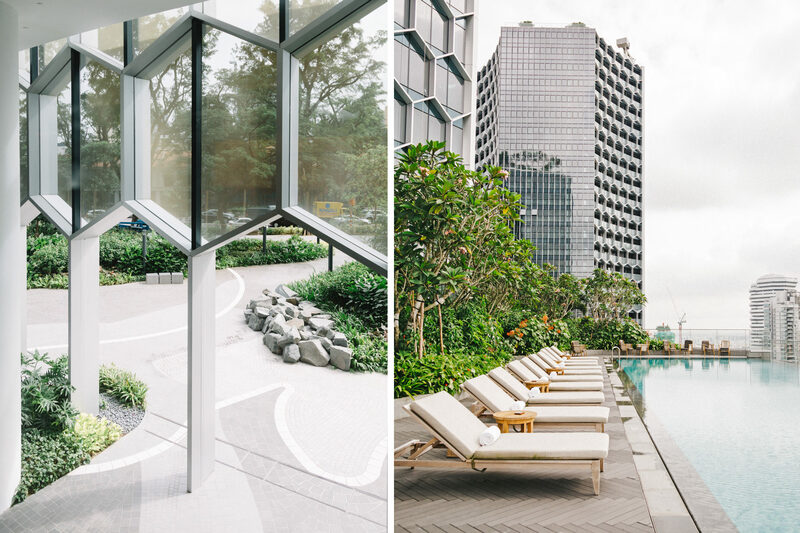 At the 2015 World Architecture Festival, the Interlace was named the World Building of the Year. 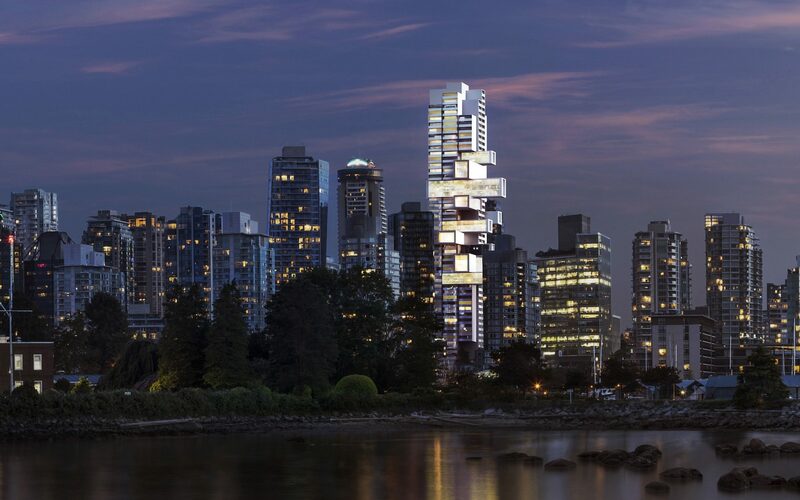 Scheeren has similar ambitions for his firm’s first North American project, a 43-story residential building in Vancouver that will break ground later this year. His design for 1500 West Georgia rises up and then propels out in a cross-stitch of projecting rectilinear cantilevers that he says will create three-dimensional spaces that connect to the urbanity of the city and its natural surroundings. “We knew right away that we loved the building,” says Daryl Simpson, senior vice president at Bosa Properties, the Vancouver-based developer that commissioned Scheeren’s firm. “Primarily we loved the degree to which it might stimulate a conversation about altering the paradigm of what a high-rise is,” Simpson says—as if Scheeren’s CCTV tower or Interlace complex had not already started that debate. But with a high profile comes public scrutiny. The Vancouver-based architecture critic Trevor Boddy is not impressed with Scheeren’s proposition. He says, via email, that the project “will, if built, become our city’s tombstone to the starchitect era. The design for Bosa Properties has all the ham-handedness of the Beijing CCTV tower he co-authored while at OMA, but with none of its lumpy awe.” He suggests the “clumsy” project is an attempt to outdo a different showpiece tower now rising in the city designed by the Bjarke Ingels Group, another global architecture firm known for similarly flamboyant forms. “It would be too kind to describe his tower’s Jenga-block massing as crystal meth in the kindergarten,” Boddy adds. Widely regarded as his first triumph, not everyone appreciated the CCTV tower’s design. Writing in The New Yorker in 2009, the architecture critic Paul Goldberger noted that “its shape is about as irrational, and as self-consciously bizarre, as you could imagine.” Some locals refer to the building as “Big Shorts,” and others say it resembles a person squatting over a toilet. It was also a target of Chinese President Xi Jinping’s 2014 proclamation that there should be no more “weird architecture” built in China. Critiques like these haven’t dissuaded Scheeren, nor the developers who desire to hire him for projects. (For its part, Bosa Properties has already commissioned him to design a second residential building in the city.) In fact, interest in his approach only seems to be growing, and on a global scale. 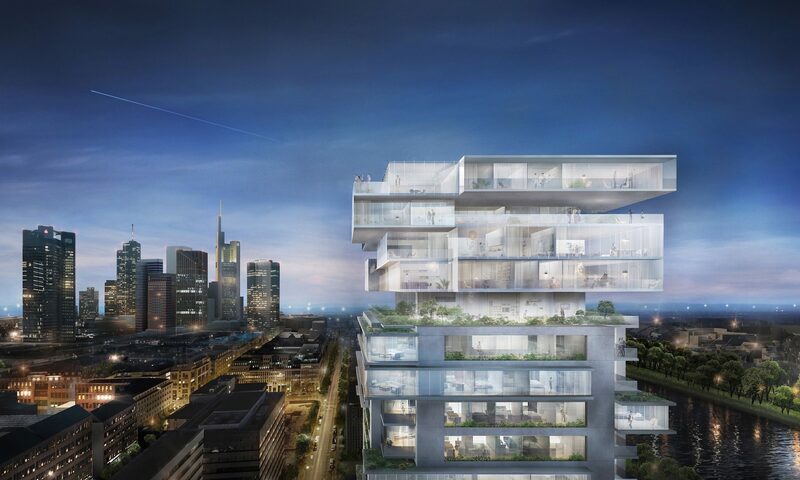 Scheeren recently secured his firm’s first project in Europe, a 23-floor apartment building in Frankfurt with sides accented by wide rectangular extrusions and indentations. In a familiar Scheeren motif, the new surfaces these create are rendered in the drawings as lush aerial gardens, patios, and overhangs. The project is also a relatively rare large-scale adaptive reuse of an old concrete office tower, and existing technical floors at the bottom and top will be replaced with new habitable levels and expanded floor plans. Scheeren says that what attracted him to the project was its broader relevance to older cities in Europe, which he says need to think more strategically about updating existing buildings to meet new needs and serve more people as cities become more dense. He hints that other major cities—in Europe and beyond—are on his radar. He’s not able to publicly announce several buildings yet, but one, he assures, “will be another extreme and superlative that will set its own very important marker.” The scale, he hints, is even larger than the CCTV project. 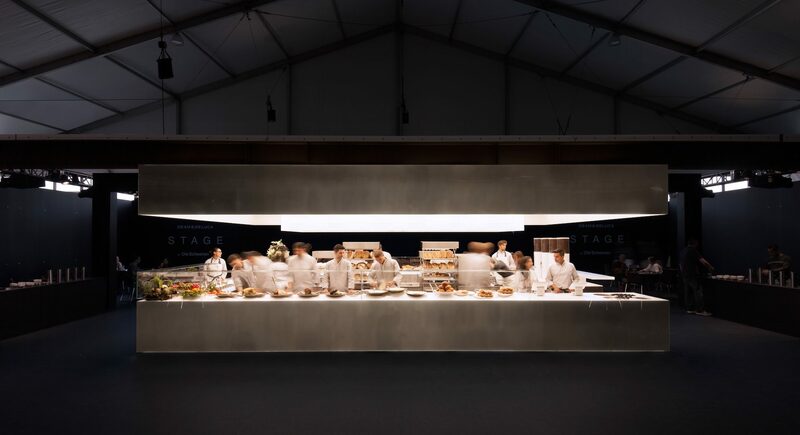 And he’ll soon be debuting his firm’s first work in the United States, at the atypically small scale—for him, anyway—of a kitchen and fast-service counter for the food retailer Dean & DeLuca, with locations in New York and Los Angeles. “I think it’s really important not to become the guy [known] for one thing, [in which] you develop a formula and [apply] that formula to every single thing that you’re producing.” He’s hoping more projects stateside will follow and that American cities won’t just serve as stopovers on the way to more ambitious work in familiar locales.